Antiques Roadshow is getting a makeover. PBS just announced the TV show’s 23rd season will debut in January with a new look. Season 23 of Antiques Roadshow premieres on PBS on January 7th at 8 p.m. ET/PT. December 13, 2018, BOSTON, MA — After more than two decades of inspiring finds, shocking values, and unforgettable reactions, ANTIQUES ROADSHOW announces its latest surprising reveal: an all-new look! 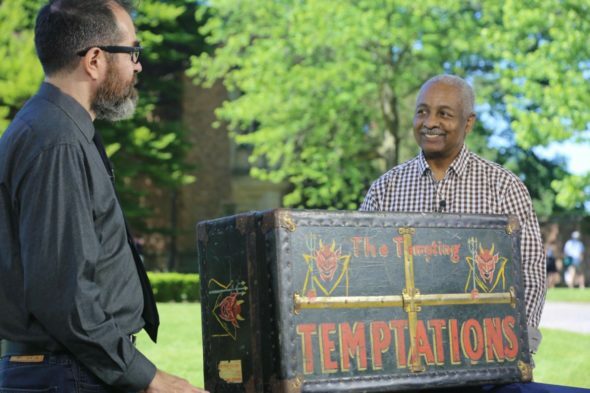 PBS’s most-watched ongoing series returns for a new season of incredible items appraised both indoors and outdoors at distinctive, historic venues that are treasures themselves. The 16-time Emmy® Award-nominated series’ 23rd season invites viewers onto the grounds of iconic destinations—including a picturesque horse racing track steeped in tradition, a hotel favored by U.S Presidents and old Hollywood alike, a Gilded Age mansion celebrating the success of “the greatest show on Earth,” and more—while still experiencing the familiar treasure hunt that America has loved for generations. In Rochester, Michigan, Detroit-area treasures are appraised at the historic estate of Matilda Dodge Wilson including a Willem Blaeu world map from around 1635, purchased at a second-hand shop for less than $20! Meadow Brook Hall episodes will air January 7, 14, and 21. In Sarasota, Florida, there’s no clowning around when it comes to show-stopping appraisals at Ca’ d’Zan, the home of circus royalty John and Mable Ringling, including an 1866 Otto Georgi oil painting that leaves our appraiser speechless. Ca’ d’Zan episodes will air January 28, Feburary 4 and 11. In San Diego, California, check into Hotel del Coronado for incredible items including a family table that was part of the 1959 “Kitchen Debate” between Richard Nixon and Nikita Khrushchev. Hotel del Coronado episodes will air Feburary 18 and 25, and April 1. In Tulsa, Oklahoma, ROADSHOW can’t stop the rain at the Philbrook Museum of Art, but outstanding Oklahoma appraisals do include the first-ever “Yield” sign made around 1950 by the owner’s father. Philbrook Museum episodes air April 8, 15 and 22. In Louisville, Kentucky, it’s off to the races for first-place finds at Churchill Downs Racetrack, including a Picasso sketch and signed photograph that could be worth six figures. But is it authentic? Churchill Downs Racetrack episodes air May 6, 13 and 20. What do you think? Do you watch Antiques Roadshow? Are you excited for the new look? More about: Antiques Roadshow, Antiques Roadshow: canceled or renewed?, PBS TV shows: canceled or renewed?